Can you judge a sport by the music that video game publisher puts on their game's soundtrack? I've haven't really paid attention to ice hockey since the glory days of the Sega Genesis, so I couldn't tell you much about the sport, but NHL 2K9 definitely reflects my taste in music. There's some Pennywise in there, and The Ramones, and hey, Bad Religion and The Offspring! It's like a Crazy Taxi reunion! Perhaps the reason I have trouble getting into sports games is I'm trying to get into the wrong sports, or perhaps I'm reading too much into this soundtrack press release. Does the music match the sport? Hit the jump for the full listing, which might be light on tunes with only fourteen songs, but makes up for it with sheer quality.2K Sports Provides an Adrenaline Filled Soundtrack for NHL® 2K9 Operation Ivy, The Ramones, Mastodon, Bad Religion and more provide just the right feel for the action packed game NEW YORK—(BUSINESS WIRE)—2K Sports, the sports publishing label of Take-Two Interactive Software, Inc. (NASDAQ: TTWO), today announced details regarding the soundtrack for NHL 2K9, which was released yesterday. NHL 2K9 features an epic music soundtrack that will blow the roof off any virtual hockey arena with some of the biggest bands and legendary artists in rock such as Bad Religion, Mastodon, NoFX, Pennywise, The Offspring, The Ramones, and many others. It will also be the first time that influential punk band Operation Ivy has ever licensed their music for inclusion in a video game. Below is the full list of tracks in NHL 2K9: Bad Religion — New Dark Ages Genghis Tron — Things Don't Look Good High On Fire — Rumors Of War Inner Circle — Bad Boys Joe Satriani — Crowd Chant Mastodon — Iron Tusk NoFX — Linoleum Operation Ivy — Bankshot Pennywise — Knocked Down Protest The Hero — Goddess Gagged Recliner — Find A Way The Night Marchers — Closed for Inventory The Offspring — Nitro (Youth Energy) The Ramones — Blitzkrieg Bop "For NHL 2K9 we wanted to create an adrenaline-pumping soundtrack that will set the mood for the intensity of hockey," said Tim Rosa, 2K Sports' director of brand and lifestyle marketing. "We have also licensed a few of the more popular hockey stadium songs, so when a player goes to the penalty box after a fight, gamers will hear tracks such as "Bad Boys" from Inner Circle or "Knocked Down" by Pennywise after a big hit, as they do in hockey stadiums across North America. For NHL 2K9 we have licensed a great collection of songs that complement the authenticity and spirit of the game." NHL 2K9 is now available on retail store shelves in North America for the Xbox 360® video game and entertainment system from Microsoft, Wii™ home video game system from Nintendo, and PLAYSTATION®3 and PlayStation®2 computer entertainment systems. A free demo of NHL 2K9 is also available for download on Xbox LIVE® Marketplace for Xbox 360 and PLAYSTATION®Network. The demo provides fans an opportunity to relive the excitement of this past season's thrilling Stanley Cup™ Final in a brief three minute period as either the Pittsburgh Penguins or Detroit Red Wings at Joe Louis Arena in Detroit. NHL 2K9, rated E10+ for Everyone 10 and older by the ESRB, is now available for Xbox 360, Wii, PLAYSTATION 3 system and PlayStation 2 system. 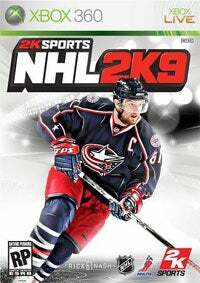 For more information about NHL 2K9, please visit http://www.2ksports.com/games/nhl2k9.